A national networking platform to help ex-forces personnel looking to move into careers in the rural sector - and their future employers - is to be launched in Gloucestershire. Known as “The Rural List Cirencester” and associated with The Liquid List - a well-established veterans’ networking series - it will develop into monthly events at the Royal Agricultural University (RAU) for both veterans and employers from across the rural economy. The initiative, which is the only sector-specific veteran networking event in the country, is the brainchild of Fiona Galbraith, a former army officer and postgraduate student of the RAU from 2017 to 2018. Fiona, who served for 23 years in the Intelligence Corps and remains a Reservist officer, said: “Ex-military personnel are highly suited to a wide range of roles in the rural sector. This includes careers in agriculture, horticulture, animal care, arboriculture, game management, estate management and other land-based careers. Their trademark resilience, team-working, flexibility, problem-solving ability, willingness to learn and sheer determination can make a huge contribution. If you are a rural employer, this network will be a fantastic opportunity for you to meet future team members. Rural employers and service leavers from all ranks are invited to the launch, which will take place at The Alliston Centre at the RAU’s campus in Cirencester on Thursday 7 February at 6.30pm. It will include a talk by a VIP guest, as well as complimentary drinks and a specially commissioned photographic exhibition by Wendy Faux, herself an ex-regular army reservist. Career opportunities exist across the country so personnel at the start of their resettlement journey can find out more about future careers, training and qualifications from employers, education providers and veterans at this event before targeting specific opportunities locally or elsewhere. Those who are intending to settle in the Gloucestershire area will also be able to speak with local employers in a relaxed setting. Professor Joanna Price, Vice-Chancellor of the Royal Agricultural University said: “The RAU has always had a strong association with the military, with many ex-service personnel choosing to study with us prior to establishing careers in the land-based sector. Many of our students also join the services on graduation. 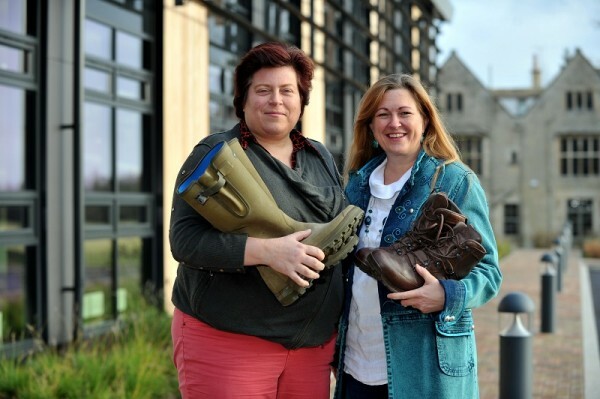 Wendy Faux, whose ‘When the Boot Fits’ exhibition will open at the event, said: “This exhibition highlights the synergy between military and rural careers. It is clear that skills are transferable and interconnecting within both careers. Often it is believed that when you leave the Armed Forces you stop one career and start a second, but what has become very clear during the preparation for this exhibition is that these two communities are mutually supporting and beneficial to whichever community you find yourself in at the time. “When I did ‘Not Just a Wife’ I was looking at military spouses and the skills they developed through the military lifestyle; ‘When The Boot Fits’ demonstrates the synergies and the skills that anyone who has experienced service life can bring to the rural environment. “Fitness, team building, working in adverse conditions, initiative in crisis are just some of the skills that apply to both communities and ‘The Rural List’ will bring these together offering a unique networking opportunity. Subsequent meetings will be on the second Thursday of each month, starting on 14 March.